Don’t live with missing teeth or the inconveniences & pain of unsecured dentures any longer. North Shore Oral & Maxillofacial Surgeons are one of the leading practices in Australasia, offering a full range of dental implants. Dental implants serve as artificial roots, firmly anchored into the jawbone, that support a fixed or removable tooth replacement. A single implant is used to replace a missing tooth, and multiple implants can be used to replace multiple missing teeth or you may choose to have all of your teeth replaced. At NSOMS, our surgeons are experts at the surgical placement of dental implants. We work with a number of very talented general dental practitioners throughout Auckland to deliver the restorative phase (crown/bridge) of the treatment. Natural-looking teeth: Dental implants look and feel like your natural teeth as the dental implant closely replicates a natural tooth root. Durable and long lasting: Dental implants are very durable and are a long-lasting solution to missing teeth. With the correct care, they should last for many years or even for life. Health benefits: Dental implants only have positive effects on your remaining teeth, helping to hold them in position. In addition, there is no need to grind down or modify healthy teeth to support a bridge or denture. With our full teeth replacement treatments you don’t need to live with unsecured dentures which can be inconveniently loose, painful, stop you from eating many of the foods you once enjoyed and socially awkward at times. We provide three of the best solutions in the market for full teeth replacement, Implant Retained Dentures, All-On-4® and Zygoma, and will recommend the best option for your needs and budget. The All-On-4® treatment concept is the best in its class of solutions for patients with no teeth or have set of teeth that are soon to be lost. With All-On-4® you only need four dental implants to support a new full-set of teeth. Fixed set of teeth: Your new set of teeth will be permanently attached to the implants and will only be removed by one of our clinicians for annual hygiene visits. Immediate function: You will receive a fixed new set of provisional teeth on the day of your surgery. Best aftercare: After the procedure, you’ll receive regular follow-ups for up to a year to ensure a complete recovery. In modern dentistry, living with unsecured dentures has faded away from being the “gold standard” treatment for people who have lost all of their teeth (or just about to). We work alongside the best dentists and clinical dental technicians to provide you with a more stable replacement for your missing teeth. No more adhesives: Implant Retained Dentures eliminate the need for creams or messy denture adhesives to keep the device firmly in place. Improved chewing efficiency: With this innovative prosthetic denture, your chewing efficiency improves, and you can eat all foods your diet allows. Easy maintenance: With their easy clip-on, snap-off functionality, you can take them out for proper cleaning and maintenance, then pop them back in for a beautiful, confident smile every day. Zygoma implants are a graftless solution for full teeth replacement, perfect for people who may not have enough bone mass. With this treatment, you’ll avoid the need for a bone graft. 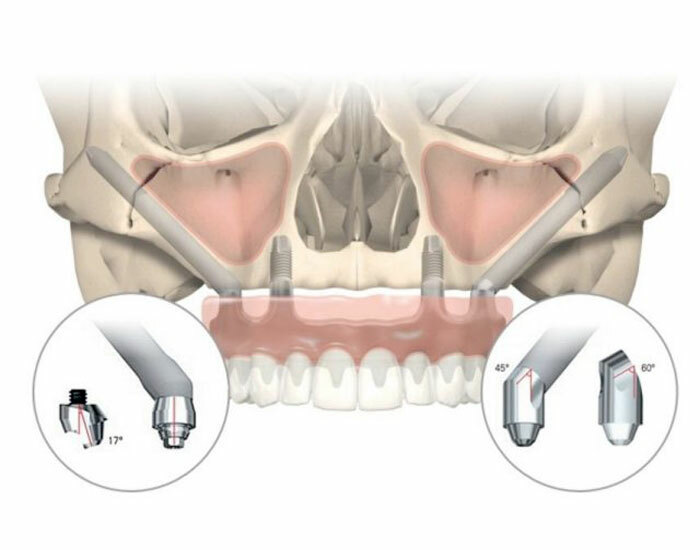 Graftless treatment: Zygoma implants are anchored in the zygomatic bone, avoiding complex bone-grafting procedures. Long-lasting: Over ten years, the average success rate is well above 95%, meaning they display incredible longevity. Specialist care: Surgeons at NSOMS are one of the few surgeons in the country who perform zygoma implant procedure.